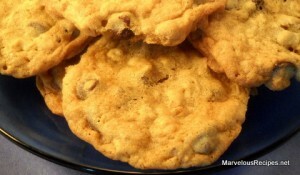 A rich, chewy chocolate chip cookie for all the cookie lovers in your family! Believe me, they won’t last long! 1. Sift together the flour, salt and baking soda; set aside. In a large mixing bowl, cream butter or margarine, shortening, brown sugar and granulated sugar. Beat in eggs and vanilla extract until mixture is creamy. 2. Add the dry ingredients a little at a time, beating well after each addition. Stir in the chocolate chips, oats and chopped nuts; blend well. 3. Drop by teaspoonfuls spaced 1/2-inch apart onto ungreased cookie sheet. Bake at 350 degrees F for 10 to 12 minutes. Cool on cookie sheet 5 minutes; remove to wire rack to cool completely. Store in a tightly covered container at room temperature. Makes 8 dozen cookies.